Steam Heating - Amity Insulation Group Inc.
Amity is the exclusive distributor of Thermon Steam Heating products and is proud to highlight Thermon as part of its complete line of insulation, metal, and accessories. At Amity, the distribution of outstanding products like Thermon provides a strong fit with our specialization in high-quality industrial materials suited to thermal insulation applications. “Thermonized” systems provide the kind of predictable operation and straightforward maintenance demanded by process plants, with Steam Heating applications ranging from freeze protection, to maintenance of temperatures close to the temperature of steam itself. Over 60 years of focused quality manufacturing sets Thermon products apart from others in the industry, and today, Thermon remains the industry's leader in heat tracing technology. Thermon steam heating systems are on the specifications list of most end users due to quality, demonstrated reliability, and low installed cost compared to multiple bare tracers, “light” tracing with spacer blocks, and jacketed systems. 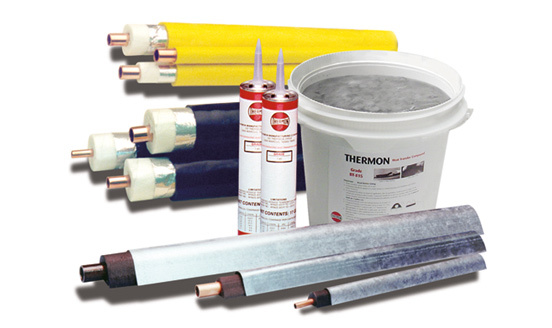 This makes Thermon essential to mechanical insulation system applications and their heavy demands.